You have to try new things. With the piano it is more naked, more pure. Being that all his previous tours have met with critical acclaim, Prince decided that with this tour, the Piano & A Microphone Tour he would develop a new format instead of the regular power shows he otherwise performed with the support of a band. The Piano & A Microphone Tour was just simply Prince, a piano and a microphone. 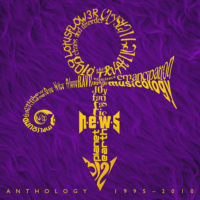 It was played only in theatres and with its stripped down format provided a highly intimate experience both for Prince and fans alike. 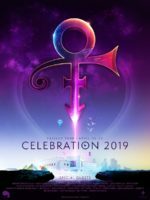 Prince used the shows to talk to the audience and revealed personal and sometimes previously undisclosed experiences of his life, particularly his relationship with and the influence of his father on his music. Its introspective content proved further poignant since it would would become his last ever tour. 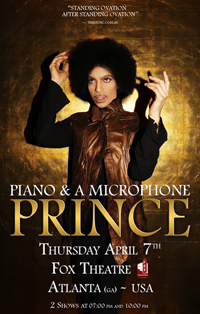 The Piano & A Microphone Tour was premiered at Paisley Park Studios on 21 January 2016 and one month later launched as a world tour. The tour was originally intended to begin in Europe the previous December but was postponed in the light of terrorist attacks which had occurred in Paris the same say of the original ticket sales. It instead began in Australia and included his first ever shows in New Zealand. The tour then visited America and performed in Oakland and Atlanta. After Atlanta the tour was planned to call at St Louis, Nashville, Washington DC, Miami and Minneapolis, and then head to Europe but the tour was tragically cut short. However, its two shows scheduled in Atlanta on 7 April was postponed to the 14th because Prince was fighting a severe bout ‘flu’. Despite performing these rescheduled shows and following his return to Minneapolis he collapsed at home on 21 April. Emergency services were called but they were unable to save him. 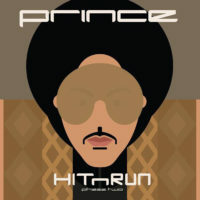 Prince was pronounced dead that morning.